A few years ago, the DAR Archives was entrusted with a wonderful gift – the personal and professional papers of its 17th President General, Sarah Corbin Robert. The DAR President General from 1938 to 1941, Sarah Corbin Robert was the organization’s leader during an especially vibrant period in American history. Fortunately, they had a capable helmsman in the form of Sarah Robert. 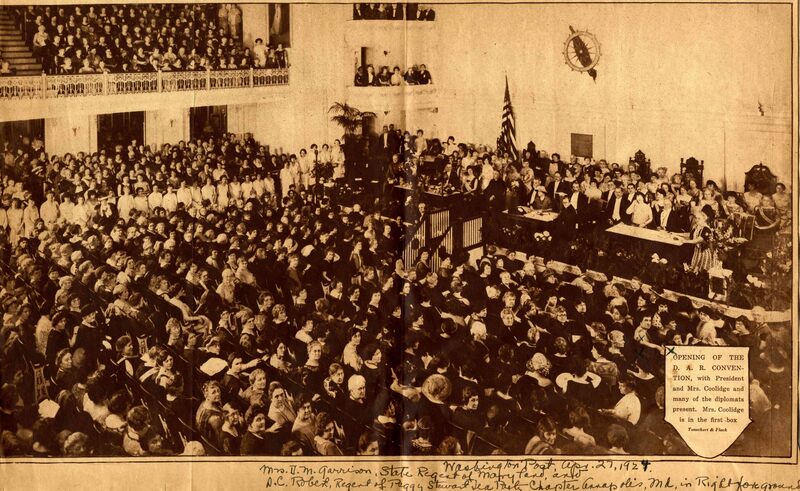 A scholar of American history, Sarah Corbin Robert graduated Syracuse University in 1909. She went on to teach American history at public high schools in New York and New Jersey for ten years. 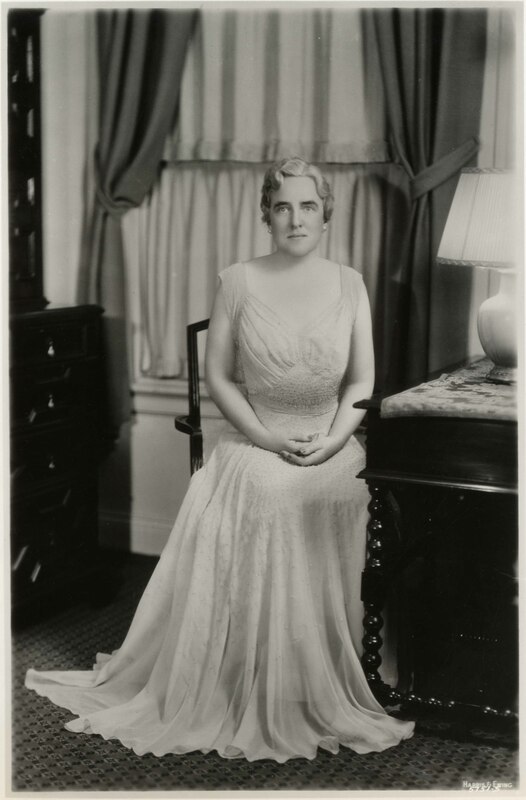 In 1919 she married Henry Martyn Robert, Jr., the son of General Henry Robert, author of Robert’s Rules of Order, the most widely used manual of parliamentary procedure in the United States. Sarah Robert would in turn become a leading authority on parliamentary procedure, serving not only the DAR as its National Parliamentarian, but numerous other organizations and individuals in search for parliamentary guidance. She taught special courses on parliamentary law at Columbia and the University of Maryland and was a trustee for her father-in-law’s Rules of Order. 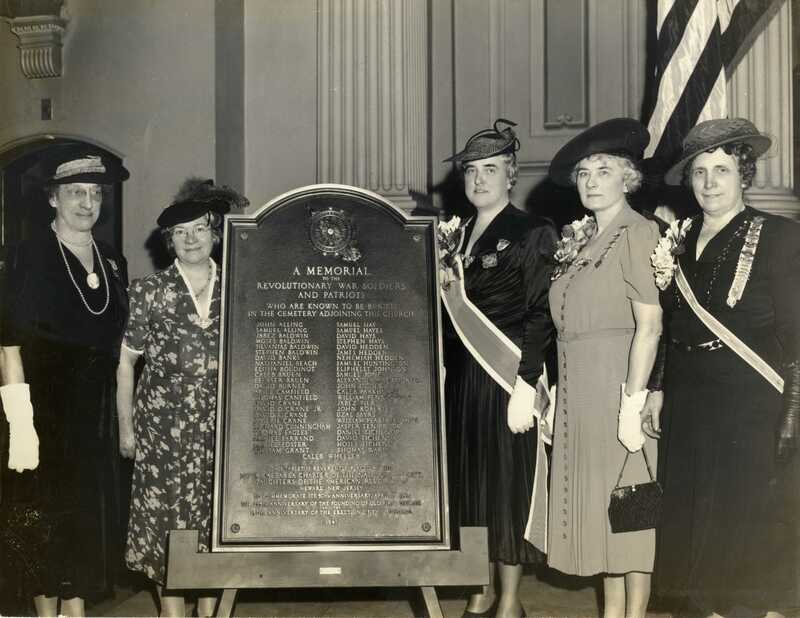 Besides her active professional life, Mrs. Robert was also a member of other women’s organizations, such as the Daughters of Founders and Patriots of America, the Daughters of Colonial Wars, the Colonial Dames, and the Federation of Women’s Clubs. 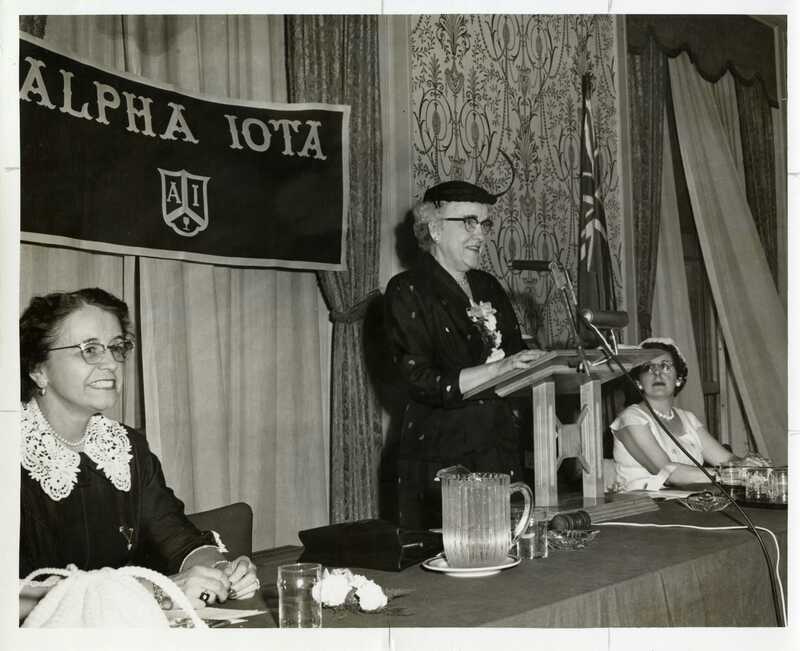 She was also extremely involved in her local community of Annapolis, Maryland, serving as the executive director for Annapolis’ tercentenary celebrations, as a member of the local historical society, and a member of the public library association. The Papers of Sarah Corbin Robert are a significant collection because they provide such a complete record of these many facets of her life, covering over 70 years. We are extremely lucky that she saved so much and we are grateful to her family for entrusting her collection to the NSDAR and its Archives. Now that the collection is in our care, it is now our job to arrange, describe, and preserve the collection, making it accessible for researchers to learn more about this amazing woman. Organizing such a complex collection brings with it some unique challenges, such as deciding what to retain and how to create organization when the original order imposed on it has been lost in the decades since creation. There were nearly 40 boxes of records that had to be sorted through, weeding out the material that did not need to be retained, such as receipts, grocery lists, and junk mail. For practical reasons, we could not keep every birthday card and invitation she had ever received. 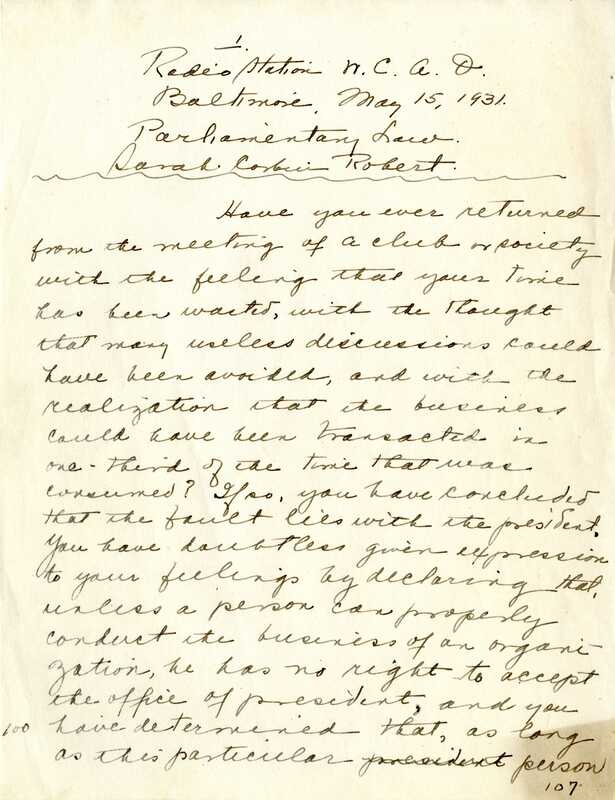 Both professional and personal correspondences were mingled together. Order had to be imposed, but where should one begin? First of all, it is critical to research the subject of the collection before diving in. In Mrs. Robert’s case, we have some records from her tenure as President General in the DAR Archives. We also have her biography in the DAR publication, The Wide Blue Sash, a wonderful resource for information on the Presidents General. A big piece of the puzzle in understanding the importance of Sarah Robert is researching her role in parliamentary law and her involvement in her father-in-law’s work, Robert’s Rules of Order. 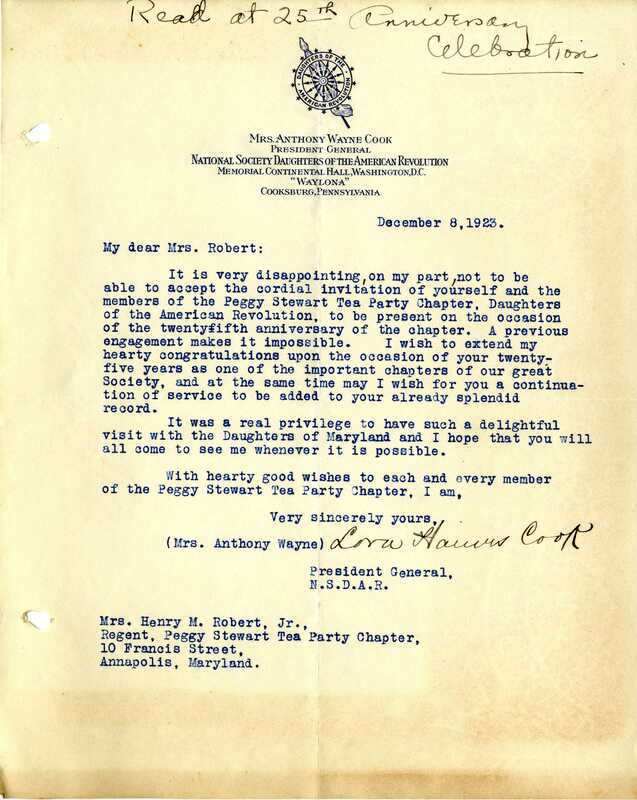 From reading her biographies and scanning her papers, Mrs. Robert’s various roles within the DAR and other organizations could be identified. Record groups, or series, could then be established based on these roles. Because we were given this rare opportunity to preserve a President General’s life, beyond her numerous positions within the DAR, we want to preserve not only Sarah Robert’s legacy as the 17th President General, but the vital parts she played in the field of parliamentary law and within her community. This is what makes her collection of papers so unique and special. Because it is a work in progress, this arrangement may be modified. Please stay tuned for further updates as we continue to work on this fascinating collection! A guide to the collection, i.e. a finding aid, is currently being written and will eventually be made available for researchers. 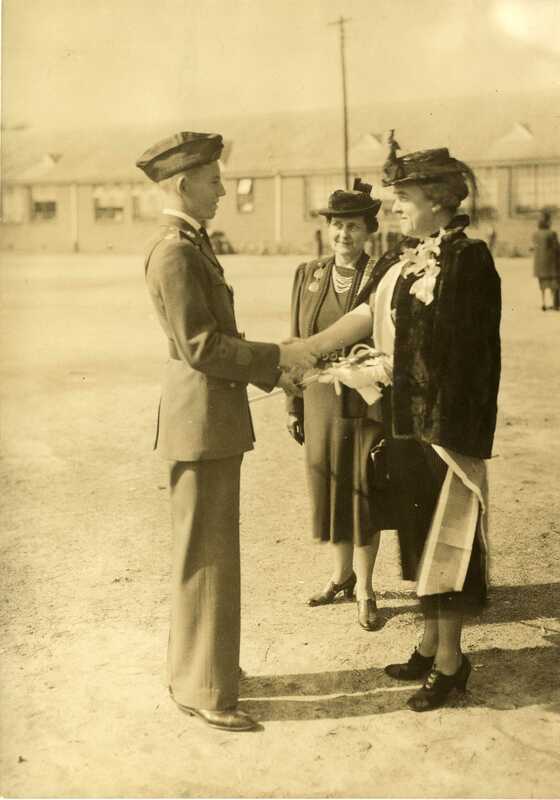 For more information or questions regarding the Sarah Corbin Robert Papers, please contact the office of the Historian General at historian@dar.org.